About 100 Danes, young and old, stood outside Copenhagen City Court in the chilly seaside winds last week to show their solidarity with four activists alleged to have illegally assisted refugees in their trek across the waters from Denmark to Sweden. While only two of the accused are Danish citizens, all are members of MedMenneskeSmuglerne, or "Those who smuggle thy neighbor"—an outgrowth of the more broad-based initiative Welcome to Denmark, which welcomes migrants and refugees into the country. Last year, over one million migrants and refugees from Syria, Afghanistan, Eritrea and other unstable nations endured the risks of exodus to Denmark and other parts of Europe. Many died during the journey or ended up in refugee camps for prolonged periods. This migration wave correlates directly to the growing xenophobia and shift to the right in many European countries, including Denmark. "Pretty much all leftist organizations in Europe neglected to consider the refugee influx on their agendas," said Mimoza Murati, one of the non-Danish activists facing criminal charges that day. "We should have been prepared because we know the political landscape." The largest multi-tribal gathering of indigenous peoples in North America in over a century is happening now at the Sacred Stone Camp in North Dakota. Leading the cause is the Standing Rock Sioux Nation. 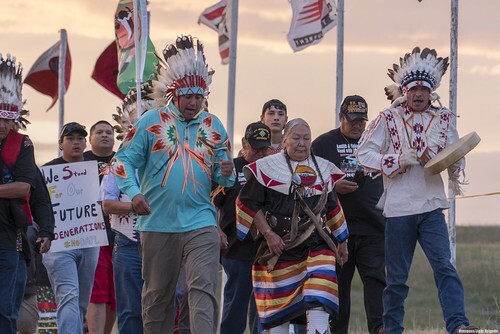 The Standing Rock Sioux and their allies are standing against construction of the "black snake" Dakota Access Pipeline (DAPL), slated to run under the Missouri River and through their historically sacred tribal sites. The tribe states it had not been properly consulted prior to construction of the DAPL, a requirement legally mandated by Executive Order 13175 (PDF). The order stipulates that: "[e]ach agency shall have an accountable process to ensure meaningful and timely input by tribal officials in the development of regulatory policies that have tribal implications." The Standing Rock Sioux Nation's assertion that the Army Corps of Engineers, an executive agency charged with overseeing and granting pipeline permits, has failed to meet the clearly-enunciated requirement of meaningful consultation, makes this case one of the strongest Native American environmental justice legal claims in history. Environmental justice, a paradigm born of a merger between the civil rights and environmental movements, is unique in Native American communities. This unique status stems from the legal classification of tribes as domestic dependent nations, sovereign as political entities, yet still under the plenary authority of Congress, as per Article 1, Section 8 of the Constitution. The plenary authority of Congress over the tribes is a stretch at best, as Native Americans predate the Constitution. Nonetheless, the Supreme Court has established a solid judicial body of law giving Congress, and only Congress, the ability to act in good faith as wards over the affairs of Indian Country, such as the 1886 case of US v. Kagama. In Saudi Arabia, a country many view as synonymous with gender discrimination, women are seeing signs of change. While a few top-down reforms have come in recent years—the right to vote in municipal elections, for example, was introduced by King Abdullah in 2011—many working at the grassroots level are agitating for more fundamental change. Over the summer, activists launched an online campaign calling for the dismantling of Saudi Arabia's controversial "guardianship" system, which puts women under the authority of male relatives—something many see as a fundamental obstacle to women's basic rights in the kingdom. For the past several months, Saudi women and their supporters around the world have tweeted under the hashtag #سعوديات_نطالب_باسقاط_الولايه ("Saudi Women Demand the End [literal: downfall] of Guardianship"). The campaign has also used the English hashtags #IAmMyOwnGuardian and #StopEnslavingSaudiWomen to draw in international supporters, as well as local advocates. The goal, says long-time activist Aziza al-Yousef, is to gain Saudi women the right to be "full citizens… [each] responsible for her own acts." Alongside their tweets, activists circulated a petition calling for the end of the guardianship system, which has garnered over 14,000 signatures. On Sept. 26, activists, including al-Yousef, brought the petition in person to the royal court, where they were unable to deliver the document, but were directed to send it via mail. As I write, Russian tanks are amassing on the line that separates those areas of Ukraine controlled by the Kiev government from the Crimean Peninsula, now unilaterally annexed by Moscow. Kiev has placed its armed forces on high alert, and there are fears of full-scale war. In addition to the Crimea stand-off, for two years Ukraine has faced a Russian-backed separatist revolt in the eastern enclaves of Donetsk and Luhansk. Despite official denials, Russia is widely thought to have troops there, backing the separatists. All this was set off by the 2014 Maidan revolution—named after Kiev's central square, which was occupied by protesters over the bitter winter of 2013-4, to demand the ouster of President Viktor Yanukovich. Just as Britain recently voted to flee the European Union, Ukrainians were seeking closer ties to it. For the Maidan protesters, the EU represented guarantees for human rights and transparency in a country dominated by corrupt oligarchs. Yanukovich represented the epitome of this kind of political animal, and set off the Maidan movement by rejecting a treaty for preliminary ties with the EU in favor of one for closer integration with Russia. He was finally removed by a vote of parliament in February 2014. By then, some 200 had been killed in repression, and some on the side of the protesters had started to arm. New elections were held in May, bringing the more Euro-friendly Petro Poroshenko to power. But separatists seized the east, and Russia annexed Crimea. Even if you don’t follow international news, it was hard to be unaware of all this if you live in the East Village. From the early days of the Maidan movement, a wall on the east side of Second Ave. between St. Marks Place and 9th Street displayed news clips from Kiev and messages of support for the protesters—adorned with the blue-and-gold colors of Ukraine and the trident that is the symbol of the nation. In case you were on the fence and reluctant to believe that the Republican candidate for president—the one who claimed he could shoot a man in the middle of Fifth Avenue without losing steam among his supporters—is a fascist, this week’s pronouncements by him and his allegedly more palatable running mate reiterate the point. As he climbs back up to a statistical dead heat in the polls, Trump complimented Vladimir Putin for his leadership style. Media criticism focused on the fact that Putin ordered the invasion and occupation of Ukraine's Crimean peninsula. Others dusted off Cold War tropes to remind us that we hate the Russians. All of this misses the point that Trump zeroed in on Putin's leadership style. This demands that we look at how he treats his own people—how he leads his own nation. Behind the headlines and vicious brutality of Syria's civil war lie amazing examples of self-organization, the story of which is largely unknown to most in the West. It is this self-organization, and not Saudi or Turkish aid, which has allowed the revolt to sustain itself through six long brutal years of repression and war. The earliest form of self-organization in the revolt were the tanseeqiyat, coordination committees formed by groups of friends and activists based in each neighborhood or town, who would rally their community for protests and demonstrations. As the revolution progressed, the tanseeqiyat were superseded by the more overtly political Local Coordination Committees (LCCs). These were committees of activists, elected or nominated from different areas, which coordinated across the country. They were anti-sectarian, opposed to foreign intervention, committed to non-violent revolt against the dictatorship, and wanted the formation of a democratic civil state. They organized protests, publicized films and reports of the revolution, coordinated days of action, and as repression mounted, provided humanitarian aid to districts and neighborhoods in revolt. They sought to direct the mass of protests towards the non-violent overthrow of the regime. Four years following its liberation, the predominantly agricultural town of Daraya, strategically located near Syria's capital, has fallen to the regime. A deal was reached to evacuate the 4,000-8,000 civilians remaining from a pre-uprising population of 300,000. The local fighters who defended their town so courageously will go to Idlib and join the resistance there. Daraya's residents know that they may never return to their homes. Photos circulated on social media showed residents gathered at the graves of loved ones to say goodbye. Fears abound of a plan to cleanse opposition strongholds permanently; and in previous evacuation deals, even those carried out under UN auspices, many were detained by the regime, never to be seen again. The Fort McMurray area had been the permanent or temporary home for many workers in the Athabasca Tar Sands, where the world's biggest industrial operation extracts bitumen to produce heavy crude oil. Some of it is piped into the US to refineries such as the BP plant on the Indiana shore of Lake Michigan. Dozens of people were arrested in May protesting that plant's expansion to handle more tar sands oil. Some of that bitumen spilled near Battle Creek, Mich., in 2010 and may never be fully cleaned up, turning some of the neighbors into self-described "accidental activists." The extraction and refining processes are so energy-intensive that, combined with the vast size of the tar sands deposit, leading climatologist James Hansen called it "game over for the climate" if the tar sands get fully exploited.